I am currently in love with Bill Granger's recipes. This is possibly the fourth time I have cooked from his cookbook. Previous attempts included the poached peach in Rose Water, crumpets and more recently the souffle pancake.. I bought his cookbooks after my third trip to Sydney last year and after my third visit to his restaurant Bills at Darlinghurst. 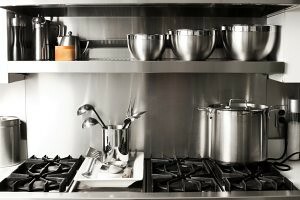 I recall an avid recipe book collector friend once told me that somehow, she did not feel compelled to own his books because the recipes were so simple. I totally agree with her on the simplicity part but boy, simple as they may be, they do work so beautifully. Take this spaghettini number for example, as the forward to the recipe claims, it is an Asian-European fusion recipe that really works. 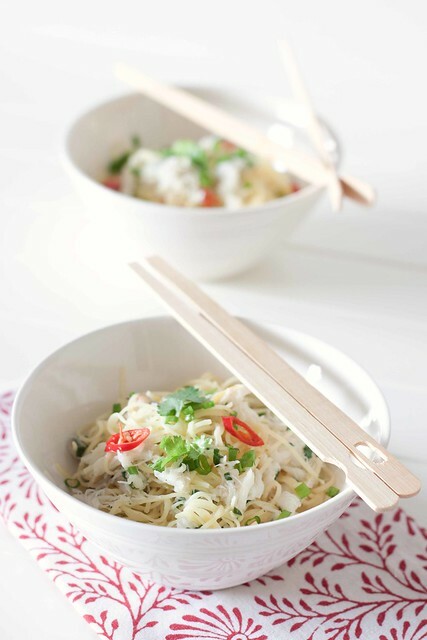 It literally takes less than 10mins to put together and the flavours are so refreshingly addictive! The zestiness of the citrus juices married beautifully with the chopped spring onion,coriander (the recipe called for parsley which I did not have) and crab meat. I went a little bit further by throwing in some chopped coriander roots and a dash of Old Bay seasoning and the end result, I swear, is totally restaurant worthy! I wish I had tried out this recipe earlier then I would most definitely have cooked it for the last party I hosted... with a dish so easy to put together, I would have more time to mingle with the guests than slogging over the stove! 1. Place crab, lime and lemon juices, lime zest, garlic, cordiander, coriander root, spring onions , chilli, sea salt and pepper , Old Bay in a bowl and stir in olvie oil to combine. Taste to adjust the seasoning. 2. Cook Spaghettini in rapidly boiling salted water in a large saucepan, according to manufacturer's instructions. Drain well. 3. 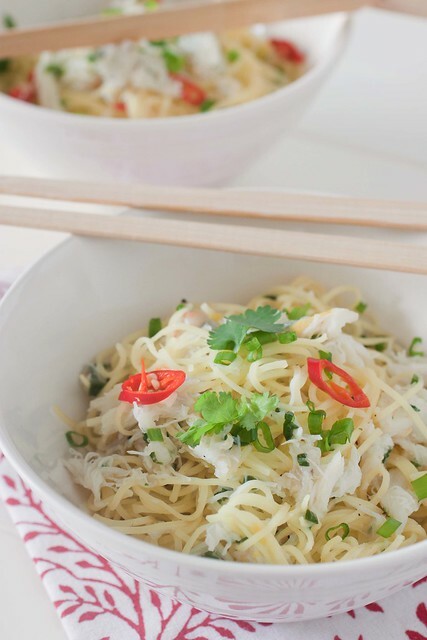 Toss pasta into crab mixture and serve in individual bowls. You know, I like eating simple foods. I think I'd like Bill Granger's recipe. They sound good. This one sounds really good. And your photograph is gorgeous. This does look so good..again though..it's your photos:) Wish I had that light..your shots are cristal clear. Very fresh flavouring!! I love it! I enjoy eating heavy pasta with meat sauce, but I also love eating simpler, lighter pasta such as aglio olio. I've never had pasta with crab meat, sounds and looks really delicious...!! Oh, btw, Happy New Year 2012 :)! ahh yes. It isn't just the simplicity of the ingredients but also the way he writes his recipes. The instructions are always straight forward and not full of too much chatter. Your pasta looks lovely and light. I love a zesty dressing like this! Yes, his recipes are excellent! Sounds like a simple and awesome dish! KIVing. Simple and delicious! And I am a great fan of Bill Granger as well. Too bad they stopped airing his shows on cable. I almost got the cookbook. Only my resolution to cook more from my current stash instead of adding new ones to my living room floor stopped me. Here in northern California it's crab season; a perfect time for this recipe. Simple and bursting with flavor, what could be better? Thanks for sharing a great recipe. 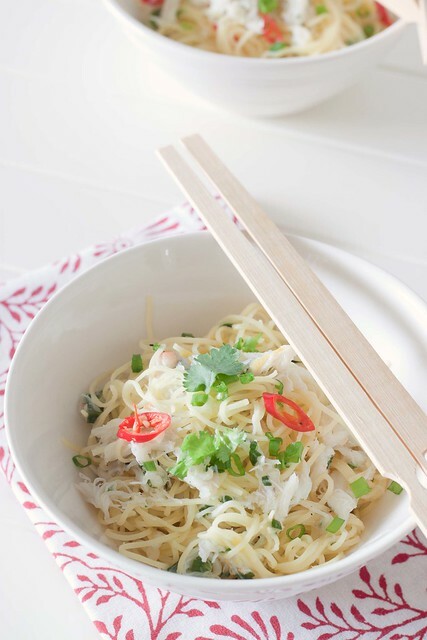 I like using angel hair as it cooks almost instantly (sometimes faster than instant noodles!) and the crab makes it so luxurious, and the citrus so refreshing. A winner! Lovely shots! And what a recipe.